There is a fairly new method of mining out there in the mining community that is rapidly gaining in popularity, with good reason. It is called “Vacking;” and, as you might suppose, involves vacuuming material. As a suction dredge vacuums material from the bottom of the river, this is a type of dry-land dredging. 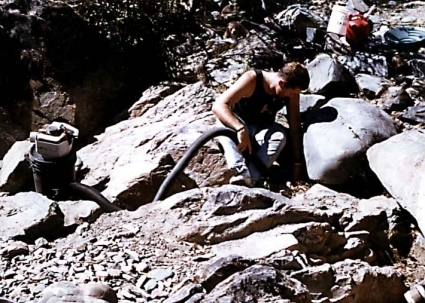 It involves using a small, lightweight unit to vacuum cracks and crevices of exposed bedrock, moss on exposed bedrock or boulders, or material in a dry wash in the desert. For this “dry land dredging,” however, there are no uncomfortable and expensive wet-suits to don, no heavy equipment to carry and then set up, and no long period of learning how to operate the equipment, or learning where to find gold. Anyone who is familiar with mining knows that there is a much larger proportion of fine gold deposited than large gold, in almost any area. Each winter, as the rivers swell with winter rains and snows, much fine gold is washed down them. The fine gold, since it is much lighter in weight, is deposited much higher on the banks, or in the material of the river. As the high waters recede with the onset of spring and summer, much of the areas where the fine gold is deposited is left exposed up on the banks of the rivers. The new units consist of a two-cycle gasoline engine mounted on a five gallon container, which is equipped with a suction hose and a crevice nozzle. They are very efficient at pulling the fine gold from moss, and at cleaning out crevices. Previous efforts to accomplish this by hand were slow and painstaking, and not very efficient. 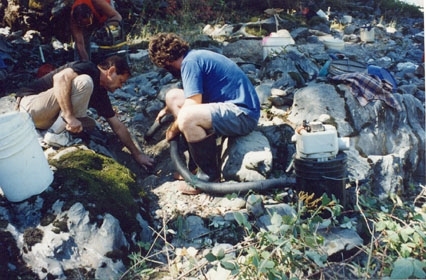 Collecting fine gold has always been one of the greatest challenges facing any miner, and some people spend years attempting to perfect their fine gold recovery. Not only does “vacking” do an excellent job at recovering fine gold — it is a lot of fun! It is so fast, simple, and easy to use, that it seems to take all the work out of mining. You are still out in the great outdoors, still getting healthy exercise, but all that’s left when you remove the excess work is the fun. Since we live and work very near a gold-bearing river, if my husband can squeeze two hours of time, he can get to his favorite spot, set up, get in most of that time mining; and still come home with enough gold to feel he has been mining. If he is dredging, that’s not enough time to more than set up and get started before he has to quit! These units come on their own back-pack frame, and all accessories are carried right inside the unit. It is a completely self-contained unit, and includes an extra fuel bottle, a crevice tool, a gold pan, a “sniffer bottle” to remove the gold from the pan, and even a sample vial to keep it in. With all these accessories, the unit weighs just 15 lbs., so you could hike into the back country with it without undue strain. Many wives who are not interested in dredging or motorized sluicing (high-banking) enjoy using this type of unit because it is something they can do completely on their own. The only problem we have seen develop is that when some of the husbands see that the gold recovery exceeds that of their dredge or motorized sluice, they want to use one also. Then, they either fight over the one unit, or join the growing group of “two-vack” families. Since they are such low-cost units, this is pretty easy to do. Special Offer on the world’s greatest Vack machine! I recently talked to one avid vack-miner who has been using one of these units for two years. He was concerned that he might possibly lose some of the fine gold out the exhaust as the unit filled, since it is so lightweight. Shortly after purchasing his unit, he fitted an elbow and extension over the exhaust, and directed it into a container of water. He has used it faithfully, and panned out the light powder that accumulated each time. He has never found even a speck of gold in it. A crack or crevice in exposed bedrock that runs crossways to the current of the river acts as a natural riffle, catching fine gold just as the riffles of a sluice do. The moss that accumulates on exposed bedrock acts much as the carpet in a sluice, only better! It is amazing just how much fine gold can accumulate there. These are prime areas for vacking. Areas where people have been working with motorized sluicing equipment have also proven to be good. Even if they have worked the area down to the bedrock, they have been unable to clean the area as thoroughly as it can be cleaned with a Vack, and generally, the richest areas are right on the bedrock. Although I have not mentioned finding nuggets with this equipment, it certainly does find them! Even areas that have predominantly fine gold in the high bedrock will trap nuggets during flood storms, and if they are there, this equipment will help you get to them as nothing else will. Since you do not work directly in the active waterway, and this equipment does not put anything into the waterway, there are no dredge permits required for the use of these units, at least in the state of California. All in all, Vacking has such a wide range of applications, in so many areas of the country, by such a wide range of people, that the gain in popularity is very understandable. It can only be expected to grow. If you should get the Vacking bug, be sure you look for us out there, because that’s where we will be every chance we get!